In a large bowl, whisk together the egg, cornflour, and a pinch of salt and pepper. Toss the chicken in the egg and cornstarch mixture. Marinate for 20 minutes. Heat a large skillet with vegetable oil over medium-high heat. Deep fry the chicken until it is golden brown and cooked through (about 7-10 minutes). Drain off the excess oil. Prepare the sauce. 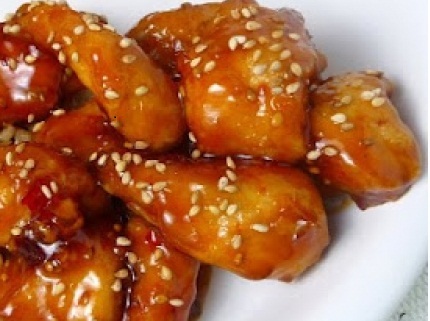 In a small bowl stir together the soy sauce, water, sesame oil, brown sugar, rice vinegar, minced garlic, cornstarch, and sesame seeds. Heat a tbsp of oil in a wok and pour in the sauce. Cook till the sauce thickens. Mix in the honey. Place the chicken in the sauce and toss to coat the chicken in the sauce.